The marshes differ from the bogs by the fact that they are usually produced at low altitudes and do not form peat. They are usually found around low-lying lochs, especially where streams enter them, forming muddy deltas as they run into the still waters. In other places they are found where a loch or pond has become silted up until the water is shallow, giving marsh plants the chance to establish themselves. It must be remembered that a marsh flora is only transient and is not a fixed association of plants like that of the Pine Forest. The marsh plants are continually adding to the soil by the decay of their leaves and stems, whilst their stems also cause obstructions which make the water deposit mud and sand around them. In time the upper layers dry out and the marsh plants gradually give place to shrubs, and finally trees. We shall come across marshes in all states of advancement in various parts of the Highlands. Marsh plants have their roots and lower stems embedded in mud and water, and therefore these parts are usually spongy in structure, with many air passages and air spaces, which allow oxygen to pass down inside the tissues to the buried roots, rhizomes and stems. They rarely possess xerophytes adaptations as they have an abundant water supply and, as they inhabit low-lying, less windy situations than the bog lands, they do not suffer from drying winds. They often form large colonies, as for example the reeds and various kinds of sedges and grasses. Who has not admired in spring-time the beautiful golden beds of these lovely flowers with their large bright green leaves? Wherever we find their golden cups, we may be sure that the soil is wet and marshy, and we must walk warily to escape wet feet. 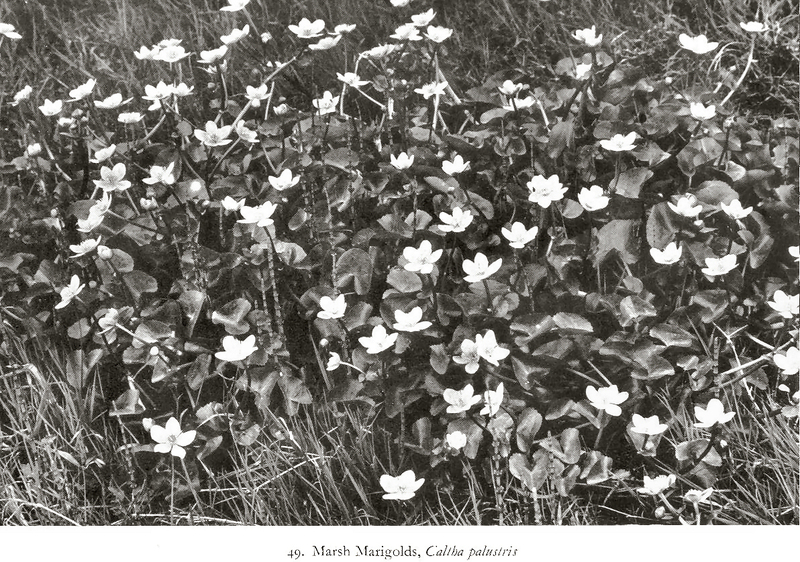 In the Highlands there are least three distinct forms of the marsh marigold. In the lower valleys, in the ditches around the meadows, in swampy riverside marshes and around lochs, the common species C. palustris is abundant. In more elevated regions this species is often replaced by C. radican, a much scarcer plant. In the higher regions, climbing well up the mountain sides, we have the form C. minor, which is a small species and quite common in boggy areas. The Marsh Marigold is a perennial, the thick tuberous root being buried deep in the mud, where it passes the long hard winter safe from frost and cold. With the return of milder conditions, a green bud forms at the tip of the rootstock and from this arise the leaves and then the flowerstalks. The radical leaves are on long, thick, hollow stalks and are large and kidney-shaped with a slightly crenate border, and as they are absolutely glabrous and very smooth, water does not lie upon them. The stems often root at the lower nodes, are often branched, and attain a height of about one foot, producing one or two flowers on stalks about two inches in length. The flowers are large, of a bright golden yellow and very conspicuous. As this plant usually forms large colonies, the conspicuousness and beauty of the flowers are greatly enhanced. 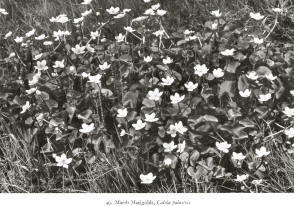 The flowers of the Marsh Marigold are peculiar in that they possess no petals, the sepals taking their place. Within the bright, golden, glossy cup, we find that the centre of the flower occupied by a green cone which consists of five to ten carpels. Around the central core are arranged the many stamens whose anthers open outwards toward the sepals. Nectar is secreted on the sides of the carpels and an insect naturally alight on the centre of the flower where it must leave imported pollen upon the carpels. As it turns round to obtain the nectar secreted around the cone, it becomes dusted with pollen, which it will transfer to the next flower it visits, thus effecting cross-pollination. Many insects visit the flower--honey-bees, bumble-bees, mining bees, flies and Syrphidae being the chief visitors attracted by the beautiful blooms. In this species the plant is much more slightly built, with much more fragile stems. The radical leaves, which are on very long stalks, are heart-shaped and have an acutely toothed edge, whilst the upper leaves are small and kidney-shaped. The flowers, which are quite small, are usually solitary and terminate a long stalk. They are much less conspicuous than those of C. palustris, which may account for its comparative rarity. With flowers, as with the business man, a advertisement if the key to success. This species, which is probably a mountain variety of C. palustris, varies greatly in size in relation to elevation and the exposure of its habitat. It often approaches Caltha palustris although it is never so luxuriant, the stems being shorter and less thick, while the leaves are much smaller. The flowers are produced on long stalks and are solitary, being slightly smaller than in the common species. This type is common in the upper glens and I picked several fine specimens in a bog close to the Fairy Loch in the Pass of Ryvoan at 1,200 feet. At higher elevations it becomes much smaller in all its parts, often being under four inches in height with solitary small flowers. This is the reverse of what often occurs in mountain varieties of lowland plants where usually the flowers are much larger and more conspicuous. I have found this variety at altitudes of 2,500 feet on Braeriach and at over 3,000 feet on Ben Nevis. The Water Avens is quite a common plant in marshy places, along streams and ditches and in boggy meadows. We may find it in company with the Red Rattle, the tall strangely perfumed Marsh Valerian, the beautiful hairy fringed flowers of the Bog-Bean and the dusky red Marsh Cinquefoil. 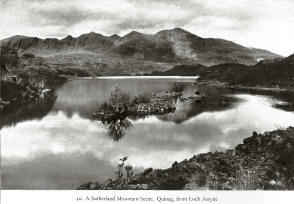 I first became acquainted with it near the head of the beautiful Glen Nevis, where it was growing in a marshy patch at the bottom of the deep, boulder-strewn gorge of the Nevis, and whenever I review my specimens this romantic spot comes back to me with its black precipices, its huge rough boulders, its swirling waters and its beauty and peace. Its rocky sides are a perfect rock garden with Yellow Saxifrage, Wood Geranium, Melancholy Thistle, Rose-root and the Butterwort watered by the little streams that tumble down from the high summit of Aonach Mor. The Water Avens is a member of the Rose Family and closely related to the Common Wood Avens, so common in the Lowlands. It possesses a perennial rootstock which usually creeps for a short distance in the muddy soil, where it makes its home. The rootstock is crowned by a rosette of radical leaves which are long-stalked and pinnate. They consist of one large, rounded, terminal segment which may sometimes be divided into three, with several much smaller leaflets further down the main mid-rib. They are covered on both surfaces with fairly long hairs, which prevent moisture being deposited upon the surfaces and clogging the stomata. This rosette sends up simple, unbranched stems to a height of one or even two feet in luxuriant specimens, and they are also clothed in pinnate leaves. At the termination of the stems solitary flowers are formed on long peduncles, which are curved, with the result that the flower is in a drooping position. The flower is a rather interesting structure possessing a double calyx consisting of five sepals surrounded by another calyx of five sepals known as the epicalyx, the sepals of which are placed in the spaces between the sepals of the inner calyx. The whole structure is hairy and forms an admirable protection to the flower whilst in bud, and also acts as a barrier to creeping insects, which would try to steal pollen and nectar. The five petals are semi-erect and of a deep purple colour shaded to orange. The flowers secrete abundant nectar like many other marsh plants do, water being a prime factor in the manufacture of this sweet substance. They are visited by many insects, especially bees. The erect position of the petals makes it necessary for these insects to alight in the middle of the flower, where they must leave imported pollen upon the hairy carpels. As the stigmas mature before the stamens it is impossible for self-fertilization to take place. After flowering each carpel produces a long awn which, after it has reached a certain length, develops a kink and then continues to grow. In a little while the piece beyond the kink breaks off and leaves the carpel with a long hooked awn. What is the reason for this hook? Well, it is a means to ensure the distribution of the species. As we have already seen, plants try to distribute their seeds as far away from themselves as possible. Thus there will be no competition between the parent and its offspring and the species will be distributed further and further from its place of origin. To arrive at this end, plants have adopted many ingenious devices whereby the seed is transported for long distances. As we have seen the Wood Geranium throws its seeds a considerable distance by the recoil of sections of the capsule; the Hawkweeds, Dandelion ad many other Composites as well as Willow-herbs, Willows, etc, are fitted with parachute-like hairs by which they float away on the wind; others, such as the Primrose, having very light seeds which are blown considerable distances by windy gusts; others, as the Wild Rose, Whortleberry, etc., enclose the seeds in a succulent envelope which is devoured by birds, the seeds being dropped far from the parent. But the Water Avens has so adapted its seeds that they may take ride upon the back or sides of any passing animal. The hooked awn catches into the wool of sheep, or the hairy coats of cows, horses, etc., or perhaps in the clothing of a passer-by, and drags the rest of the seed in its hairy coat with it. The animal moves on with its tiny voyagers who gradually drop off one by one. Some perhaps fall on dry ground and do not germinate, but others will fall in wet places and give rise to new clumps of Water Avens. So does the study of plant life illustrate how amazingly Nature obtains her ends. For had the seeds dropped down to earth around the parent plant they would have been suffocated and would have died for want of living space, but being carried far away they have a much better chance of survival. Another common plant of the marsh lands, riversides, lochsides and ditches is the Meadow Sweet, or as it is often known, the Queen of the Meadow. Like the Water Avens, itelongs to the Rose Family, although at first sight one would hardly associate its small clustered blooms with that family. The Meadow Sweet is a large plant with deep-striking perennial roots which push down into the muddy soil, and tall, strong, flowering stems which may attain a height of as much as three feet, and are usually of a reddish hue. The stems and rootstock are covered with large pinnate leaves consisting of from five to nine leaflets which are deeply toothed on the edges. These leaflets are smooth and green above, but the under surface is covered with a thick, white, felt-like down. This down is a common feature of marsh land plants, its purpose being to protect them against condensed moisture which would otherwise clog the stomata. The flowers, which are very small, are arranged in very dense clusters at the termination of the flowering stems, and are cream colored and very sweetly perfumed. Here we have a case of flowers being conspicuous, not because of their individually large size or striking colours, but because of the grouping of great numbers of small flowers to form a very conspicuous cluster of blooms, and as if that were not enough, and to make even more sure of visitors, these flowers are endowed with a very sweet perfume. The Meadow Sweet blooms in mid-summer when competition is at its peak and only those plants which show the greatest executive ability can hope to attract insects. The little flowers are each formed like a small rose, with many stamens around a central disc which contains the few carpels, and around which the nectar is secreted. The stigmas mature before the stamens so that imported pollen will be left upon them before their own stamens mature. The stigmas continue to be receptive after the stamens have reached maturity so that in dull weather, when few insects are abroad, self-fertilization will take place, this being better than failure to set any fertilized seed at all. Small bees and flies arrive to sup at the nectar so liberally presented to them, whilst beetles and pollen-seeking bees arrive for the pollen so easily obtained from the myriad flowers. A very conspicuous and imposing member of the Marsh Flora is the Marsh Thistle (Carduus palustris). It is a plant of the less moist marshes and is not found in standing water, although its roots dig deep into the mud and water below the surface of the soil It attains a greater height than any other British thistle and nine to ten feet is not unusual for it. It belongs to that section of plants known as biennials, i.e. it only flowers in the second year of its existence and then dies down. In the first year it forms a fine rosette of large, narrow, fiercely spinous leaves, deep green above and possessing a few scattered hairs on both surfaces. During this period the leaves are actively engaged in manufacturing starch, which is stored up in a large, fleshy, tap-root. The spines prevent the leaves being eaten by animals. The rosettes pass the winter safety as they offer little exposure to the wind, can support the weight of snow and, being of a tough consistency, are not damaged by frost. In the spring a tall stem arises from the midst of the radical leaves, and nourished by the abundant starch contained in the tap-root, it rapidly increases in height. Leaves are produced upon the stem and their margins runs some distance down the stem as a line of stiff, sharply-pointed spines. The leaves themselves are narrower than the radical ones, but are also very spiny, and thus the whole plant is well armed against the attacks of animals. The stem supports a large and heavy inflorescence and is particularly strong. Besides its outwardly stout appearance, we should find that it is hollow within and as a tub is a very strong structure, the stems are well able to resist strong winds. The flower heads are numerous and arranged in several clusters in an irregular corymbs at the summit of the stem. They are rather small and egg-shaped and are surrounded by an involucre of many prickly pointed bracts, often with spider web-like hairs intermingled with them. Their function is to stop creeping insects, such as ants, reaching the flowers. After fertilization the flower heads are transformed into a mass of silky down, as the pappus of the seeds lengthens. When ripe they are borne away on the wind to recommence the life cycle if they fall on suitable ground, and as the stems are so high the seeds get a good send off. From what has been said it must be obvious that the Marsh Thistle is well adapted to the life struggle and it is not surprising that it is a very abundant plant. Another very common, plant in marshy and wet places is the Marsh Ragwort (Senecio aquaticus), which is closely related to the Common Ragwort (see Chapter XXI). It is a more slender plant than the latter, and the radical leaves are undivided, whilst the yellow flowers are in the much less dense corymbs. It is a perennial, but very often behaves as a biennial, this seeming to depend largely on the suitability of its habitat, good conditions being conducive to a longer span of life. The Marsh Hawk’s-beard (Crepis paludosa) is quite a common plant in the marshy land over much of the Highland area, but is more particularly a shade plant, and hence prefers shady marshes such as occur where streams and springs are found in the woodlands or in the shade of cliffs and steep hillsides. The young plants consist of a rosette of large, ovate, coarsely-toothed leaves which are deep green in colour and quite devoid of hairs. The rosettes are rooted in the soft soil by a large, white, fleshy tap-root containing a white acrid fluid which prevents them being eaten by animals. In spring a leafy stem arises from amidst the leaves to a height of about two feet. The stem leaves are oblong and toothed and clasp the stem by two large, pointed auricles, this last character being of value in identifying the plant. These leaves are thin in texture and quite smooth as the Marsh Hawk’s-beard is not troubled by lack of water. The stem is terminated by a corymbs of from eight to ten large, yellow, flower heads, whose involucres consist of several rows of deep, green bracts covered with black spreading hairs, which are often glandular and act as a barrier to crawling insects. The flowers are pollinated in the same way of those of the Wall Hawkweed. (see Chapter VII). This is the only member of the Valerian Family which we shall meet with in the Scottish Highlands. It is a handsome and rather imposing plant and is quite common in some places, being a typical marsh plant. It passes the winter by means of a thick, tough, underground rhizome which is filled with starch and gives off several runners which creep through the mud and become erect at the extremity. They produced many fibrous roots and are covered by small scale-like leaves. From their tip is produced a rosette of large and beautiful leaves consisting of from nine to twenty-one leaflets arranged innately. Each leaflet may be from one to three inches long, is lanceolate in form, and its margin is coarsely toothed. The under surface is covered by scattered coarse hairs, which save the stomata from becoming blocked with water by preventing the formation of a water film over the surface. The flowering stems may attain more than four feet in height, are rarely branched and are rather hairy at the base. They produce a few scattered leaves resembling the radical ones, but much smaller in size. The flowers are arranged in large, terminal, corymbs cymes, which are very conspicuous and of a pale pink or lilac colour. The individual flowers are very small, the calyx being almost imperceptible as it is only a tiny green ridge around the summit of the inferior ovary. The corolla consists of a narrow tubular portion, becoming funnel-shaped with five small spreading lobes. Within the tube are a few white hairs which prevent the entry of small creeping insects. Only three stamens are produced and their filaments are connected to the corolla tube, whilst the anthers are produced well beyond the corolla entrance. The tiny green ovary is surmounted by a large fine style which is, however, shorter than the filaments of the stamens, hence the two lobed stigma does not project as far from the corolla tube as do the anthers. The flowers are mainly constructed for pollination by butterflies which are always to be seen around the dense masses of flowers. For this reason the nectar is hidden at the base of the corolla tube, and the flowers produce a sweet and powerful perfume. The anthers mature before the stigma and when they have shed their pollen, but not before, the two lobes of the stigma spread apart and the flower is ready to be pollinated. Owing to the cymose arrangement of the flowers, there is a long flowering season, the flowers opening in succession a few every day. Thus in a single inflorescence we may find flowers in every stage of development, hence one insect may pollinate quite a number of blooms at a single visit. After flowering, a ring of hairs grows up from the summit of the ovary, in a similar manner to that which takes place in the Composites. The hairs from a pappus which acts as a parachute to the seed when it is blown from its lofty perch by the autumn winds. Like that plant, it possesses a creeping rhizome giving off runners which produce new plants. It differs in the leaves, which are oblong or lanceolate and possess very short stalks. They are a paler green in colour and much less hairy, whilst the odour of the plant is much less offensive. The spikes of flowers are much more crowded, the flowers themselves being pale bluish-purple in colour, whilst the corolla tube is shorter in length and the lower lip is broader and shorter than in the case of other plant. It is pollinated in exactly the same way, being constructed for the visits of bees. This handsome plant is a close relative of the Red Campion (see Chapter XIII) and is a characteristic plant of marshy and wet places. It is a perennial and, like most marsh plants, possesses a short rhizome which gives rise to several erect flowering stems which only branch in the upper part. They are clothed with roughish , short, stiff, downward pointing hairs which make it difficult for ants and other creeping insects to climb the stems. Even if they do traverse this formidable barrier, it is only to find the upper part of the stem is covered with sticky hairs which trap the poor unfortunates, who in spite of their struggles are doomed to a horrible death. Thus does Nature arm her children against thieves and robbers. The flowers are produced in terminal panicles and are unmistakable. They resemble those of the Red Campion in structure, but each petal is cut into four linear lobes, the whole effect being to give the flowers the appearance of having been torn to shreads. The reason for the cut up flowers is difficult to imagine, for entire petals, as in the case of the Red Campion, would be more conspicuous. The flowers are scentless and are visited by butterflies, for which the flowers are adapted. To find them in bloom we must visit the marshes in June as this species is in flower only when the cuckoo is singing, hence its Latin name of cuckoo-flower, Flos-cuculi. Another beautiful marsh plant which must be looked for early in the year s the Cuckoo Flower, which belongs to the Cruciferous Family. It must be know to most people, its dainty flowers being welcomed with the same sentiment as those of the Primrose. It is a perennial with a short, tough roostock which often produces small tubers which are easily broken off and form new plants. From the summit of the rootstock is given off a rosette of thin textured, pinnate leaves each consisting of from seven to eleven leaflets which are rounded in form. The flowering stem is erect and smooth and may attain over one foot in height. It produces scattered pinnate leaves with narrow leaflets quit different from those of the radical leaves. The stem is terminated by a dense raceme of white or lilac flowers, which are often three-quarters of an inch across. Each flower consists of a calyx of four green, narrow, erect sepals, two of which have a pouch like base in which nectar is secreted. The four petals have long, narrow, erect claws, whilst the rounded limb spreads outwards to make a landing stage for the bees. They are lined with dark veins which run down towards the claw and guide the bees towards the nectarines. Within the flower we should find six stamens, four of which are longer than the other two. They form a ring around the cylindrical ovary, which is terminated by a short style in the young flowers. An insect must push its proboscis down between the claws of the petals to reach the sepal pouches and their nectar, but in so doing it must brush its face and head against the anthers. At a latter period the style lengthens to place the stigma beyond the anthers where it must be touched by any insect arriving at the flower. After fertilization the ovary forms a slender pod about one inch in length and containing many seeds. The pod opens by two valves and the seeds are left upon a central partition from which they are blown by the wind. This little grass-like plant s very common in marshy places in the Highlands. It has a tufted rhizome which gives off slender runners forming daughter plants and in time forming large colonies. The leaves are peculiar in being succulent in texture and cylindrical in form, their bases being swollen and sheathing. From their midst arises a smooth stem about six to twelve inches in height. It is terminated by a spike of inconspicuous greenish flowers, each of which is surrounded by a perianth of six green rounded segments and possesses six stamens on long, slender filaments. The ovary is a rounded structure and consists of three chambers, and is surmounted by three feathery stigmas. As one can guess this flower depends on the wind for fertilization. This small plant is distributed throughout the Highlands and is very common in marshy places, being especially fond of the edges of rivulets and springs. It climbs the mountains to over 3,000 feet, but at the same time it is abundant at sea-level. It is remarkable in being an annual and this explains its small size. The plants usually grow together in large tufts, each individual consisting of an erect stem about six to ten inches in height and clothed with little, sessile, opposite, smooth leaves. The stem is terminated by a slender panicle of tiny flowers, in which the calyx consists of five very narrow, pointed sepals, which are longer than the white petals. Within the corolla are ten stamens at the bases of which tiny drops of nectar are secreted. The stamens mature before the pistil and hence cross-pollination is often secured. Small flies are the chief visitors, being attracted by the glistening drops of nectar. This plant is not common, although distributed throughout the Western counties of the Highlands and Hebrides. I have only twice encountered it during my tramps in western Scotland. Once I found it covering the sides of a ditch which bordered a road in the southern part of Mull. Its lovely pink flowers starred the bright green, mossy banks and it gave me a thrill of pleasure to find it there in such beautiful surroundings. I found it again one bright September day, this time in the land of Lorne, but it was too late for any flowers and only its seed capsules were to be found. It prefers wet, mossy places along the edges of streams and rivulets, and wet, boggy places in meadows and moorlands often in association with the Marsh Pennywort. It is a lowly plant with delicate, slender stems which creep over the mosses, and give off fine roots at each node which help to anchor the stems and at the same time assure its water supply. The stems are covered with tiny, rounded, opposite leaves which add to the delicate beauty of the plant. They bend upwards at the tips, and from the upper leaves arise a few pale pink flowers on fine stalks about an inch in length. It is a lovely sight to see a large colony of these plants covered with dozens of dainty, bell-like flowers. This, of course, helps to make the flowers attractive to insects as they are not perfumed. The flower consists of a calyx of five, very tiny, pointed lobes surrounding the pink, campanulate corolla, which is deeply cleft into five narrow segments. Within the corolla, and standing erect around the pistil, are five segments. Within the corolla, and standing erect around the pistil, are five stamens whose filaments are covered with woolly hairs. A little nectar may be produced, but the flowers are mainly visited by small bees and flies for the sake of the pollen. After fertilization the flowers fade and the ovary swells to form a many-seeded capsule. When ripe the upper part of the capsule breaks away, like a tiny lid, from the lower portion, leaving the seeds exposed upon the central receptacle, and as they are very light they may be blow a considerable distance by the wind. Whilst exploring the edges of streams and rivers and the marshy ground around them, we may often become aware of a strong, mint-like smell, especially if the day be warm and damp. This odour betrays the Water Mint, of which two main species occur in the Highlands. One is called the Water Mint (Mentha aquatice), the other the Whorled Mint (M. sativa). The latter is a hybrid species arising from a cross between the Water Mint and the Corn Mint (M. arvensis), which is also a frequent plant in cultivated fields in the Highlands. Both species form dense colonies into which competitors penetrate with difficulty, and the numerous runners push outwards, increasing the territory of the colony each year. The Water Mint has a long, creeping stem, giving off long, branching roots into the mud and water. The stems produce rounded scale leaves at each node. In the summer and autumn the stems give rise to many slender runners which rest snugly buried in the mud and dad leaves till the following spring. The stems rise erect at their extremities to a height of about eighteen inches, are covered with soft hairs and produce pairs of stalked, ovate, toothed leaves, which are also hairy. The stem is terminated by a large, close spike of pinkish flowers. Each tubular flower secretes nectar at its base, the inner, lower portion being covered with short hairs which impede the entry of creeping insects. In the young flowers, the four stamens project beyond the corolla, where they will be touched by any insect visitors, the stigma being at this time hidden in the corolla. In older flowers the stamens have withered and the style has so elongated that the stigma lobes project and occupy the position originally held by the anthers. Bees and butterflies attracted by the large, conspicuous heads of sweetly-smelling flowers visit them in great numbers and much cross-fertilized seed is formed. The Whorled Mint is a very similar plant, but the flowers are produced in whorls in the axils of all the upper pairs of leaves. They are also visited by bees and butterflies, but as the plant is a hybrid, very little fertile seed is set, the plants depending on their runners for the continuation of the species. The plants vary greatly in character and all types may be found grading from one parent to the other. For this reason many sub-species have been named and several of these may be found in the Highlands. We have already made acquaintance with the Speedwell in other sections of this book and here in the marsh lands we again meet three members of this beautiful genus. The commonest and most outstanding species is the Brooklime (Veronica Beccabunga). I forms large masses along the edges of rivers, streams and rills, on low, marshy loch shores, in wet ditches and meadows. It has fairly thick, smooth stems which creep over the mud or even float on the water along the stream’s edge. From the nodes bundles of fine roots are given off to anchor the stems in the mud so that floods will not sweep the plants away. The stems give off runners during summer and autumn, and these pass the winter safely buried in the mud. The stems curve upwards at their extremities and rise to about one foot, producing fairly large, ovate leaves, which are in opposite pairs, rather fleshy, very smooth in texture, and of a bright green. From each leaf axil arises a raceme of small, very bright blue flowers, the upper petal of each possessing dark blue veins, which form honey-guides to the bees and flies which visit the flowers. The Water Speedwell (V. Anagallis-aquatica) is a rather similar plant, but its leaves are lanceolate, the racemes of flowers are rather longer, whilst the blooms are smaller and pale blue in colour. This plant is rather less common than the Brooklime, but is usually a stouter and larger plant, being often as much as three feet in height. The Marsh Speedwell (V. scutellata) is a more slender, less robust plant, but of a similar habit, the stem being covered in pairs of smooth, lanceolate leaves. It can be identified from the other two Speedwells by the fact that only one raceme of flowers is produced by each pair of opposite leaves. The flowers are very small and flesh-colored with dark honey-guides. The Willow-herb Family (Onagracea) is well represented in Britain and eight members of the genus Epilobium are to be found within the Highland area. The marshlands claim two of these species and they are of widespread occurrence, especially by streams, ditches and lochs, and also in wet meadowland. The Small-flowered Hairy Willow-herb (E. parviflorum) is not a very conspicuous plant, but it is very successful in the life struggle. Below the surface of the mud, it possesses a slender, woody rhizome giving off many much branched roots. From its extremity arises a fairly tall, leafy stem at the summit of which the flowers are produced. If we dig up a plant in the autumn, we shall find that the rhizome has given rise to several pinkish buds, which in some cases may have produced short, scaly outgrowths, known as offset which next year will give rise to new plants. The almost stalkless leaves are alternate and usually grow more or less erect. They are covered with soft hairs which give them a greyish hue, although in some forms the hairs are almost absent. The flowers are produced singly in the axils of the upper leaves and, although they appear to have long stalks, they are in reality nearly sessile, the apparent stalk being the long cylindrical ovary at the summit of which the flower is produced. It is composed of four small pale rose petals arranged as a cup at the base of which nectar by a disc on the summit of the ovary. The eight stamens form two rings round the four-lobed stigma. The small, inconspicuous flowers are visited by small bees and flies, but are probably more often self-fertilized, as the narrowness of the cup keeps the stamens pressed toward the middle of the flower where pollen may be left upon the stigmas. After fertilization the long ovary lengthens and swells until, when the seeds are ripe, it splits open by four valves and seed are released. Each one has a tiny tuft of silky hairs attached at one end and by this means floats upon the wind to be distributed far and wide. The second species is the Marsh Willow-herb (E. palustre). It is very widely distributed and climbs the mountains to well over 2,000 feet. Some authorities believe that it is only a lowland form of the Alpine Willow-herb which it greatly resembles, although, of course, on a much larger scale. Like that plant it perennates by means of slender runners and it has smooth, narrow leaves. Its eight stamens are in two rows, the anthers being at first situated below the club-shaped stigma. Later on, however, the stamens of one row lengthen so that the anthers are placed above the stigma, so that if cross-pollination has not been effected the flowers can be self-fertilized. This must often happen as the flowers are not at all conspicuous. The seeds are distributed as in the preceding. Our Highland marshes possess another beautiful plant in the Water Forget-me-not, of which modern botanists have distinguished three species. The first is Myosotis palustris which, although not common in the Highlands, may be found here and there south of the Caledonian Canal, especially in the west. It frequents wet ditches and the sides of streams and rivulets, usually forming dense masses. It possesses a creeping stem rooting at the nodes and becoming erect at the extremity to give rise to weak, leafy stems about one foot in height. The sessile, ovate leaves are almost smooth in this species. The flowers, which are produced in a branched cyme, are of a beautiful, pale blue colour, which matches the rain-washed sky of April, and as if to enhance their beauty, they possess a yellow eye at their centre. They are distinguished from those of the other two species by being over half an inch in diameter, and are constructed and pollinated in a similar manner to those of the Alpine Forget-me-not (see Chapter VI). The Tufted Forget-me-not (M. caespitosa) is a much more common plant and I have found it in large quantities in the marshy Lochaber meadows. It is a much branched plant with slender, hairy, erect stems and small downy leaves. The tiny sky-blue flowers, which are produced in long racemes arising from the axils of the upper leaves, are only one-sixth of an inch across, and are thus distinguished from the other two species. The Creeping Forget-me-not (M. repens) has a short rhizome producing numerous, leafy runners which help the plant to form large colonies. Its erect stems and leaves are covered with long, spreading hairs, whilst the pale blue flowers are about one-third of an inch across. It can be distinguished from the other tow by the fact that the flowers have very long slender stalks, and when they have been fertilized, these stalks bend downwards. This species is widely distributed in the Highlands and has been found at 2,000 feet in some mountains. We have in Britain two Golden Saxifrages belonging to the Saxifrage Family. The Oppoisite-leaved Gold Saxifrage (Chrysosplenium oppositifolium) is to be found throughout the Highlands in marshy places by streams and tarns, in boggy woodlands and up the mountain sides into the realm of alpine plants. I have found it at least 3,500 feet up on Ben Nevis forming large, green masses beside those beautiful fresh springs, where we may find the Starry Saxifrage, the Alpine Stitchwort and the Alpine Willow-herb. On the other hand, it can be found in bogs at sea-level in the Western Isles. The other species, the Alternate-leaved Golden Saxifrage (C. alternifolium), has a much more restricted range, being found in the eastern and central Highland area and in Argyll. It is found in the same places as the other species and also climbs to over 3,000 feet on the mountain sides. This is yet another member of the flora of Ben Lawers. Both plants are of a low habit with delicate, creeping stems rooting at the nodes and sending up many erect, leafy shoots which are never more than four or five inches in height. The leaves in the former are bright green, rounded, shortly stalked with a crenate margin, and they are always opposite, and covered with a few weak hairs. In the latter the lower leaves have longer stalks and they are always alternate. The stems branch above to form a spreading tuft of leaves. The stalkless flowers are very small and golden yellow in colour, and are surrounded by leaves which are often golden hued, hence the name of plant. The flowers possess not petals, the calyx taking on their function. They possess eight tiny stamens surrounding the two-styled ovary, which stands upon a nectar-secreting disc, the nectar glistening like dew in the sun to attract small flies. In a young flower, the anthers will be seen to be placed at the centre of the flower, but when they have shed their pollen they recurve exposing the now mature stigmas. It has been suggested slugs, which abound in damp places, pollinate the flowers by crawling over them, if so, then even these miscreants have some good in them.